The IIT Madras is the organizing institute for the GATE 2019 exam. The application process of GATE 2019 was completely online and was available through the GATE Online Application Processing System (GOAPS) website. 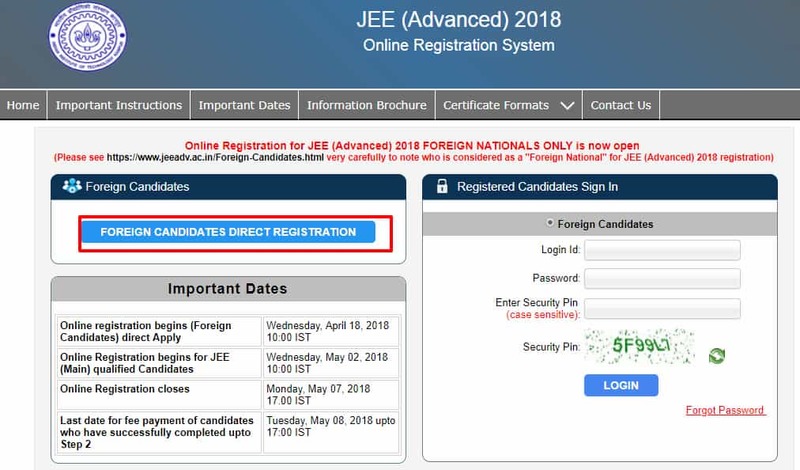 Step 1: Go to the JEE Advanced 2019 official website to register yourself. Step 2: Click on the link given for registration as shown below. Step 3: Enter the details like JEE Main 2019 Roll number, Password and Security pin. Click on Login button. Step 4: Enter the details like personal, academic, communication and other details. 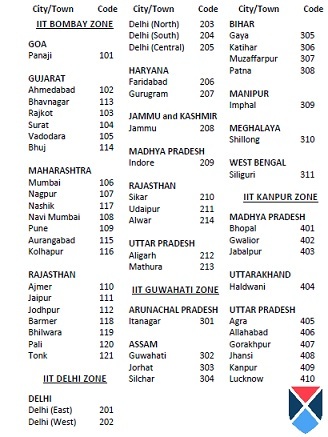 Also, choose the JEE Advanced 2019 Exam Centres according to your preference. Medium of JEE Advanced: Choose the medium in which you want to appear for the exam. Candidates can take up JEE Advanced 2019 either in English or Hindi. 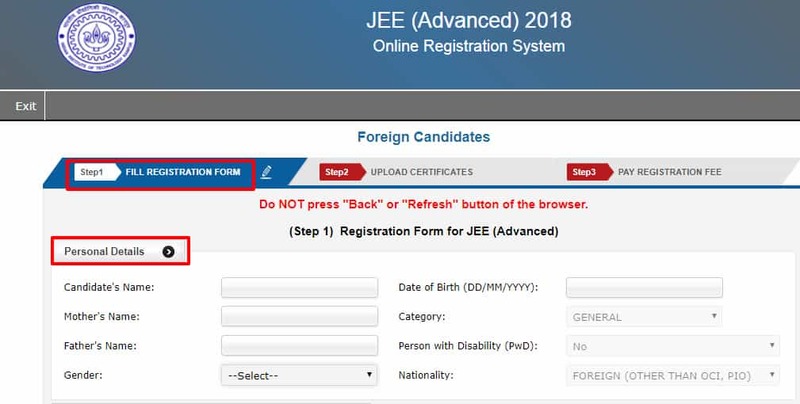 Cross Check: Candidates must cross-check all the details mentioned before submitting the JEE Advanced 2019 Application Form and then click the 'Submit' button. Upload Photograph: Click on the "Upload Photograph" button and browse your computer to select and upload your photograph. Format and dimensions: The candidate's photograph must be in JPEG format, should not be larger than 100 kb, and its dimensions should be 3.5 cm x 4.5 cm. Upload Signature: Upload the scanned copy of your signature. Format and dimension: The signature should be in JPEG format, the file size should not be larger than 30 kb and its dimensions should be 3.5 cm x 1.5 cm. Step 5: The Application form fee can be paid either through online or offline. Step 6: After fee payment confirmation, download and take the printout of the application form for future reference. Step 1: Visit the official website for JEE Advanced 2019 and click on 'Proceed to Register online'. Step 2: Click on the "Foreign candidate direct registration" button. 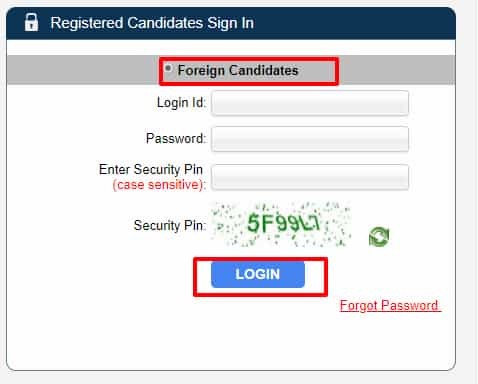 Note: If the Foreign candidates have successfully registered themselves, then they can directly login by providing credentials like Login ID, Password and Security Pin. Step 3: Fill in the registration form with personal details, academic details, address, exam centre and choose a password. Step 5: Pay the registration process fee of JEE Advanced. The JEE Advanced 2019 Registration fee for the candidates who belong to different categories is different. The category wise application fee is mentioned in the JEE Advanced Application Form Details 2019 section. The applicants can pay the fees through debit/credit card or net banking of SBI bank. The candidates must provide the credentials required to make the payment for the application form. The candidates who want to take the JEE Advanced 2019 in DUBAI have to pay the registration fee using an International debit/credit card issued by foreign banks or issued outside India. The candidates have the option of paying the application fee in offline mode with the help of E-challan. The candidates must have the printout of the e-challan issued by SBI bank. The candidates must submit the e-challan with the application fee to the nearest branch of SBI. Security Question: The candidate has to answer the security question that candidate had selected while filling the application form. Verification code: The candidate has to enter the verification code sent to his/her registered mobile number. Reset link: The candidate can retrieve the password by using the reset link that will be sent to registered e-mail ID. Exemption: The registration fee does not include service charges, processing fees and any other charges that the banks may levy. Declaration: Candidates must read the declaration before clicking the "Submit" button to verify that all information is correct with no grammatical mistakes. What if the DOB entered in JEE Mains is not same in the DOCUMENT required for Jee ADVANCED? You can correct the details in the online application form when 'Correction Window' date will be announced. At that date, you can make changes in the form. What is the application fees for the OBC-NCL category candidates? What is the application fees for the General category students in JEE Advanced 2017? The JEE Advanced application fees for the General category students who have their exam center in India is Rs. 2400 for male candidates and Rs. 1200 for female candidates. The JEE Advanced application fees for candidates who have their examination centers in SAARC Nations is USD 135 for male and female candidates. While the application fees for candidates who have their centers in Non SAARC Nations is US 270 for male and female candidates. What is the percentage of seats registered for SC/ST category for JEE Advanced 2017 exam ? Is it mandatory to provide my fingerprints to appear for JEE Advanced registration? Yes, you are. It is a part of the pre-exam procedure to take a fingerprint of your index finger. What would be my login id to apply for JEE Advanced 2017? The login id would be your JEE Main roll number. The password will also be the same as that used for JEE MAIN. What documents will one need to upload during the online application process of JEE Advanced exam? a) Class X mark sheet with date of birth on it. In case, it is not mentioned, you will need to upload your DoB certificate instead. 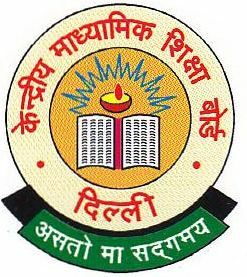 b) Class XII mark sheet (for students who appeared for the exam in the previous year). c) Caste, Category and/ or PWD certificate, as applicable. Make sure that they are in the prescribed formats (available in the Information Brochure of the exam and can be downloaded from the official exam website). d) Scribe form (for blind candidates only) in the prescribed format. Candidates are advised to keep scanned copies of these documents ready before beginning their application submission process.